Leather clicker press for sale ,it is suitable for die cutting leather ,artificial leather,real leather,fabric ,paper or similar material. 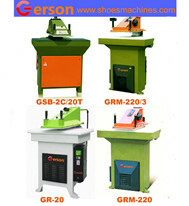 1.Brand new leather clicker press have many types:from 8 tons to 30 tons.small cutting table to large cutting table. 2.It can die cut one layer of leather or several layers of leather or other similar material. 3.It can be die cut any shapes with the formed cutting die.knife. 4.It is hydraulic driven clicker press type and easy to operate and maintain. 5.Accept custom build and design or OEM production .